Cooking is an artistic process and cookbooks when designed with love and creativity can incite all sorts of wonderful magic – and quite possibly healthy eating too! 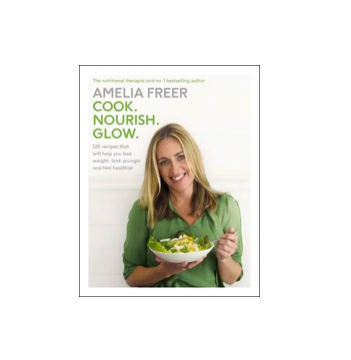 I found such adventure in Amelia Freer’s Cook. Nourish. Glow and am rather excited by the discovery. Admittedly, picking up the rather hefty bible made me feel as though I was invited to indulge in all the joys of pregnancy – without of course having to add to the family. Indeed, beneath the three guiding principles follows an enticing offer: 120 recipes that will help you lose weight, look younger and feel healthier. It really doesn’t matter if you’re desperate for the first, or concerned about the second – if eating healthy matters to you, irrespective of how much you weigh or how you old you are, then this is an excellent tome with which to arm yourself. The good thing about Freer’s recipes is that while you will recognise old favourites dotted throughout there is often a lovely new spin on them. Baked eggs, of course who hasn’t done that? But not in a ramekin or even rancheros style in ceramic pots but in a capsicum? Delish! Your very own kimchi? Yum. Green harissa? Yay! Apples, bacon, brussel sprouts and poached eggs? Yes, please. It’s not that the recipes are complicated or even require a shop at the fancy supermarket but that they genuinely will inspire you to keep experimenting with your own meals. Personally, my favourite takeaways include creating my own spiced seeds. Freer recommends including pumpkin, sunflower, sesame, fennel and cumin and once roasted and fragrant add necessary seasoning (and/or chilli) and in less than ten minutes you have a handy snack or a perfect addition to that salad or soup. Also on her recommendation, I’ve started using my ice cube trays a little differently – add your chosen herb (or a mixture) to each cube and then adding olive oil or melted coconut butter and freezing overnight. Suddenly you have your own perfectly sized herb butter! If you grow your own herbs then these will also make fine presents straight from your garden and ready to use and flavour stews, casseroles or even stir-fries. The Happy Tummy section also became a quick favourite. I’ve never used dulse (a sea vegetable) but it’s not unlike kelp and goes well with scrambled eggs. The fish pies are going on the Sunday night menu (easy and quick) and I have decided to invest in a spiralizer to make celeriac ribbons – because clearly that’s the only way to make the ultimate guilt free carbonara. Also I can now have evenly sized cucumber ribbons rather than my highly variable but textured affair. There are also some great cocktails, friendly mashes and some rather exquisite dressings that will turn your frumpy everyday meals into a wonderful love affair. Desserts even beckon, offering quick and easy remedies when you have guests who crave something sweet or wee people who deserve more than a sugar rush – and their parents will thank you for it too! Needless, to say I highly recommend this book and it’s earned a very respectable place on my shelf of cookbook creations. Time to experiment!